Sealaska Heritage Institute (SHI) will sponsor its second education conference for teachers and administrators in Southeast Alaska in an effort to promote culturally responsive pedagogy in schools. The three-day event, Our Cultural Landscape: Culturally Responsive Education Conference, will feature nationally-known keynote speakers, including Dr. Christopher Blodgett, Zaretta Hammond, Dr. Randall Lindsey and the Rev. Michael Oleksa. It will also include breakout sessions on place-based teaching and learning; early childhood culturally-responsive education practices; and equity in education. SHI is currently accepting proposals from presenters. 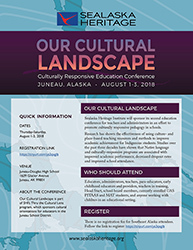 The purpose of the conference, scheduled Aug 1-3 at the Juneau-Douglas High School, is to provide educators with a deep understanding of culturally-responsive education and equip them to transform their classrooms, pedagogy and curriculum to fully support all students’ success. The conference is part of SHI’s education program Thru the Cultural Lens, which gives cultural orientations for educators in the Juneau School District. SHI’s first cultural education conference was held in 2017 and drew about 140 educators from as far away as Nome and Fairbanks. Travel and lodging scholarships are available for educators from our partner schools in Hydaburg, Klawock, Angoon and Hoonah. Blodgett is a Washington State University faculty member and a licensed clinical psychologist. He has been the principal investigator for more than three dozen federal and national foundation grants addressing high-risk children and families. He is the director of the CLEAR Trauma Center at WSU. Trauma informed schools’ work in the CLEAR model now includes multiple schools in Washington, Oregon, and California. Hammond is a national education consultant and author of Culturally Responsive Teaching and the Brain: Promoting Authentic Engagement and Rigor for Culturally and Linguistically Diverse Students. She is a former English teacher and has been doing consulting and professional development around equity, literacy, and culturally responsive teaching for the past 21 years. A professor emeritus of educational leadership at the California State University–Los Angeles, Lindsey has focused his time on the importance of diversity. He does so by working with colleagues to design programs for schools, city-wide agencies, and organizations. He is the author of Cultural Proficiency: A Manual for School Leaders. Dr. Oleksa is a storyteller who seeks to foster greater understanding across boundaries of race and culture. He is a leader in the development of cross-cultural education in Alaska, an educator of Alaskan teachers, and a student of Alaska Native languages and cultures. His book, Another Culture/Another World explores the great diversity and common humanity of Alaska's cultural mosaic.